Even though Pinterest is primarily a visual platform and you know how powerful images are… did you actually know how powerful your words are too? Pinterest seems like a social media platform to many, but in reality, you should be thinking of it as a visual search engine instead. You discover new things on Pinterest because you scrolled through the Smart Feed or you typed something in the search bar. Think about how pinners use Pinterest themselves. Put yourself in the shoes of your ideal audience. 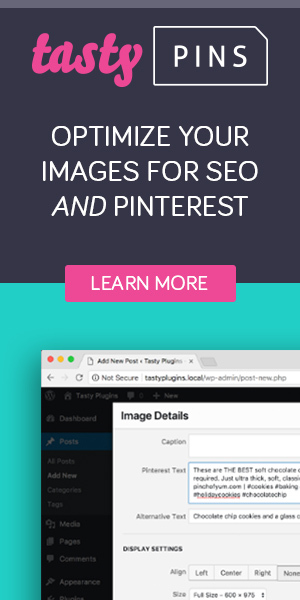 That’s literally the best tool you can have in your Pinterest marketing toolbox! So the people you’re trying to target: they’re looking for something — and you just might have the answer to their problem! But HOW can they find it?! Let’s face it, the people you want to target with your content will not be able to find it if you do not use keywords and descriptions on Pinterest. Using keywords is basically like guiding the way. Whispering “I’ve got just what you need right here!” as they scroll through the results on Pinterest. Yes, Pinterest is basically all pretty photos & graphics. But how does Pinterest know what the heck your image is about? They don’t! You need to help them and they will help you. A little scratch my back, I’ll scratch yours type of thing. If you accurately describe your pin and use the proper keywords, Pinterest will turn around and put your pin in front of the right people. Leading to more clicks, traffics, sales, subscribers, followers which is the end goal here. And that is the key to a mindblowing Pinterest marketing strategy. So let’s break it down and talk about what keywords are in the first place. They’re specific words that are related to your niche and are related to the pin you are posting. We will talk more about keywords, how to find them & where to use them! Now the secret to an epic Pinterest marketing method for your blog is not just using keywords. It’s using the right keywords. The key is to be strategic and to be SPECIFIC. The best way to find the right keywords is to head over to Pinterest! So let’s pop over there and take a look at how you can grab keywords directly from there. This is what’s popular on Pinterest right now. Take note of things and think about whether or not any of your content falls into this categories. If they do, use them as keywords! If not, here’s how to find keywords that ARE relevant to your blog post topic. Let’s use the example of organization. Pretend you are writing about organization tips or a tutorial for organizing a part of your home. This is what people are searching for! Pinterest is giving you popular keywords you might want to use in your search. You can choose one or we can just hit search on the word “organization” alone. Here is where long tail and short tail keywords come into play. Short tail keywords are broad meanwhile long tail keywords are more specific. If we chose “organization tips” as the keyword for our pin description that would be considered a short tail keyword because it’s composed of just two words and is pretty general. On the other hand, if we looked at the first tile in the search and chose “organization ideas for the home” — that is a long tail keyword because it has more words. I like to use long tail keywords when it comes to my Pinterest marketing strategy because they target more specific people. Next, you should also be using keywords in your pin descriptions (duh!) So it’s time to craft 2-3 sentences telling pinners what your blog post is about using the keywords we picked. Here’s where you should be putting your skills to the test. Let’s say our pin is about organizing your closet. Do you struggle with closet organization? Click here to check out this blog post all about organization ideas for the home and organization hacks that’ll make your life easier! See what we did there? We used organization, closet organization, organization ideas for the home, and organization hacks. We used a combination of short tail and long tail keywords to get the idea across of what our blog post is about. On top of that, we used a call to action (click here to…) We encouraged the reader to take action and click on the pin. After you create your pin description, you’ll want to add hashtags. Hashtags are fairly new with Pinterest but they don’t look like they’re going away any time soon. Pinterest recommends adding 2-3 hashtags at the end of your pin descriptions. They help get your content more visible on the Smart Feed. When you start typing out the hashtag, Pinterest will recommend different hashtags for you as well as show you how many pins are in each hashtag. Related: Are You Making These 5 Huge Pinterest Mistakes? Some example hashtags we can use in our Pinterest marketing strategy are #organizationtips #organizationhacks #organization. And it’s always best to include a branded hashtag as well. In our case, #simplyamanda. After the hashtags, we like to use the blog URL as a keyword too and include it at the end because if someone searches for simply-amanda.com, all of my pins will come out. Your pins are NOT the only place you should be using keywords. Your board titles should be keyworded along with your board descriptions. If you have a board all about organization, a great title with keywords would be “Organization Tips & Tricks for the Home” or something along those lines. For your board descriptions, you would use the same method you did above for the pin descriptions. You don’t need to use hashtags in your board descriptions because they are not clickable at the moment. And that’s a wrap on how to transform your Pinterest strategy using keywords. Overall, keywords are SO important and people often overlook them but they are so powerful. So many accounts often see an increase in monthly viewers, impressions, and clicks just because they went back and updated their pin descriptions. I offer Pinterest account audits and customized Pinterest marketing strategy guides to help get you to the next level in your blog & biz. And if keywording your whole account seems like a lot of work I also offer Pinterest account makeovers where I can take care of all of that for you! If Pinterest is holding you back, let me know and I’d love to help. This was a really useful blog. Love it.